Idaho Governor Butch Otter and Boise Mayor David Bieter welcome conference attendees Tuesday Morning. 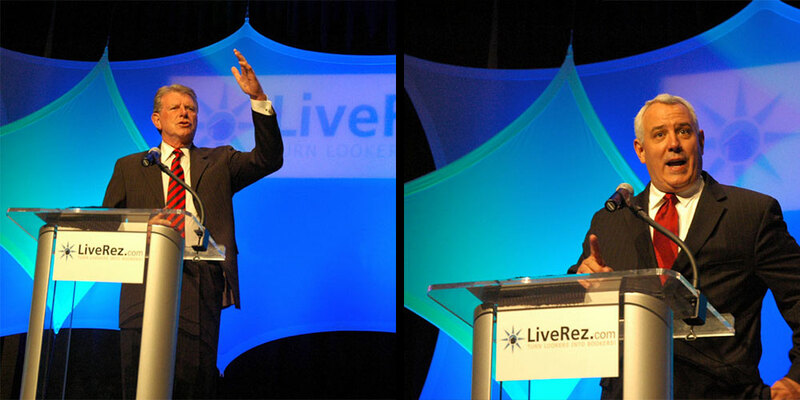 Tuesday, the 2014 LiveRez Partner Conference saw two distinguished guests: Idaho Governor Butch Otter and Boise Mayor David Bieter. The mayor gave conference attendees an exciting look into the city of Boise, mixing in a dose of humor and interesting facts about the city he so loves. He ended his speech by teaching attendees a few words in Basque, a culture that is a big part of the history of the city. Then, Idaho Governor Butch Otter took the stage to welcome conference attendees to the state of Idaho. Otter talked to attendees about Idaho, sharing interesting facts about the state. Among other things, he recounted how LiveRez was part of Idaho’s thriving technology industry, which includes tech giants like Micron and HP. Here at LiveRez, we can’t thank the governor and the mayor enough for taking time out of their busy schedules to come speak at the inaugural partner conference. Check out the slideshow below to see pictures of their visit.